In Improving Your Audio: Hardware Edition, I focused on the importance of good audio hardware. No amount of post-processing is going to turn poor raw audio into a listenable podcast/webcast/screencast. It would be like trying to print a high resolution image from a grainy scan. Sure you can interpolate pixels to clean up the graininess, but you’re not going to make detail magically appear that wasn’t in the original scan. The same is true with audio. You can clean up bad audio by removing pops and hisses, but you’re not going to make good sound magically appear from poor quality raw audio. The popping is caused by the rapid burst of air overloading the input capacity of the microphone, which results in clipping. 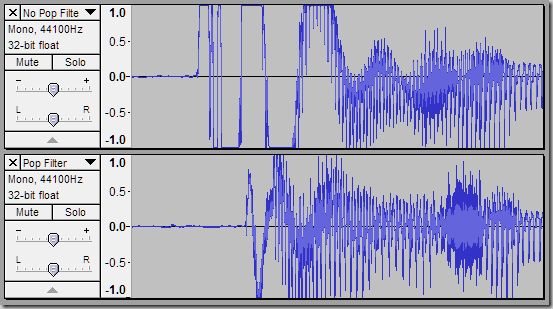 You can see it if we look at the waveform of the raw audio. Most headset microphones like the LifeChat LX-3000 have a wind shield, which performs the same function as a pop filter. A wind shield is a fancy term for that piece of foam on the actual microphone. The main disadvantage of a wind shield over a pop filter is that wind shields “colour” the audio more. 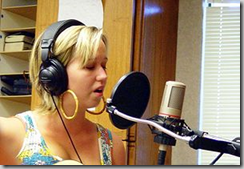 A good pop filter is acoustically neutral, which means that your audio sounds the same with and without the pop filter – it only eliminates the popping from “p” and “t” sounds. Also remember to attach your pop filter to your mic stand or boom and not directly to the microphone otherwise the microphone will pick up vibrations from the pop filter. The moral of the story… If you’re going to spend money on good audio gear, don’t forget to buy a pop filter. The $20 it costs you will more than pay for itself in better audio quality and time saved in fewer edits and retakes. Until next time, happy ‘casting!